Contracts are perhaps the most important feature of Chronicles of Elyria. Contracts give power back to the players, unlocking an infinite number of occupations and professions and allowing them to play roles in Elyria even we haven't thought of. The foundation for marriages, guilds, trade agreements, in-game mail systems, families, and even governments, Contracts play a crucial role in Chronicles of Elyria and solidifies its place as one of the first true sandbox MMOs. 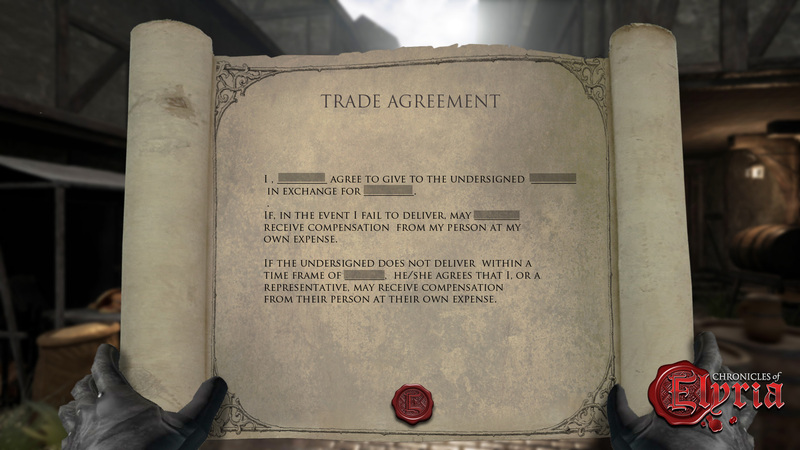 There are two types of contracts in Chronicles of Elyria, Explicit and Implicit, and each one is initiated differently. Explicit contracts are more like your traditional contracts. They're written documents which are reviewed and signed by all members who want to execute them. Signing the contract means you agree to uphold your end of the bargain or face the pre-arranged consequences. Unlike explicit contracts, implicit contracts don't require participants to sign them to take effect and they're instead initiated in other ways. The most common implicit contract is the law and legal system. Local, Regional, and National leaders can draft laws as part of their region. Once signed in as law, anyone who steps foot within their jurisdiction is bound by the implicit contract. Whenever you initiate a contract there's a set of consequences for breaking it. If either party breaches the contract they're at risk of having to pay the consequences. These consequences can be enforced but it's up to you, or someone on your behalf, to enforce them. Contracts also enable the quest system for Chronicles of Elyria. Instead of NPCs at predictable quests hubs giving out the same quests to every player, in CoE other players, NPCs, and even Offline Player Characters (OPCs) will use contracts to offer tasks to players based on their needs. A merchant may run out of reagents, leading them to ask you to bring 10 elixirs back from a far off city, utilizing the contract system to ensure delivery. A farmer might have a problem with bunnies eating all his carrots, asking you to eliminate them for a reward. But after that task is complete - the reagents received or the bunnies removed - that quest will no longer be available in the world.